The pathological conditions discussed in this page will involve pathology that can and usually must be reversed by brain surgery. This may include brain bleeds caused by trauma to the head. Advances in neurosurgery have resulted in a much greater percentage of severely brain injured persons awakening and having hope for recovery. An even more significant improvement in dealing with severe brain injury has been methods of more rapidly getting injured people, including to a trauma center. Key here in many cases are the helicopter and the brave people who risk their lives in air transport of brain injured persons. The other really significant issue is being able to see the enemy before it kills, primarily with the CT scan. Without this rapid intervention the risk of death is significant and the extent of damage to brain tissue will go increase exponentially as time passes. An intracranial lesion is a brain bleed. The brain, even more than most parts of the body, is filled and fueled by blood. If any part of the brain is cut or ruptured, it will cause a brain bleed. Brain bleeds can be rapid or slow, but always involve potentially fatal pathology. A bleed can either be directly to a blood vessel or to brain tissue itself. The bigger the blood vessel involved, the shorter time period there is to repair the brain bleed to prevent further brain damage and or death. While the brain is a large percentage filled with blood, that blood is only healthy if within blood vessels. Blood improperly touching brain tissue, such as neurons, is toxic to that tissue. Thus, after significant bleeding in the brain, much of the area where the bleeding occurred will see large scale cell death. Thus, one of the first goals of brain surgery is to stop the bleeding so that it does not kill additional brain cells. An epidural hemorrhage is a bleed which occurs between the dura (the coating around the brain – see the previous page) and the skull. While this bleed does not have the same risk of directly damaging brain tissue, the epidural space is an area where bleeding may quickly result in a compression of the brain as the epidural space fills with blood. Prompt brain surgery has great success in reducing the damage from an epidural hemorrhage. The subdural hemorrhage is a bleed which occurs between the dura and the brain. This bleed cannot only involve the risks of compression of the brain tissue as in an epidural bleed, such a bleed also risks direct injury to the brain cells. Brain surgery is almost always critical. 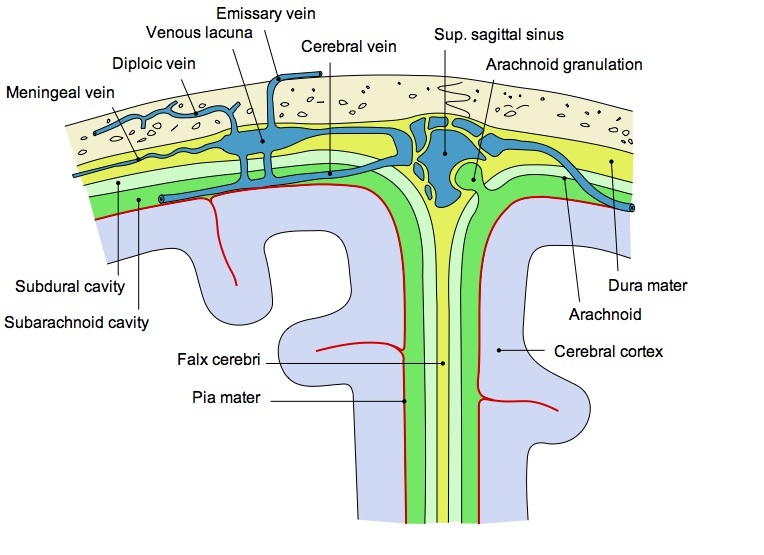 The relationship between the dura (epidural above – subdural below), the subarchnoid space and the cerebral cortex (brain) is shown here. This is where a brain bleed will occur.